"There is something magical and life giving about transforming materials into functional forms of art." So says Matt Impola, the mastermind behind the Handcrafted Movement. The project was born out of Impola's desire to combine his ample experience in construction with his passion for the artistic, sustainable, and refined elements of craftsmanship. 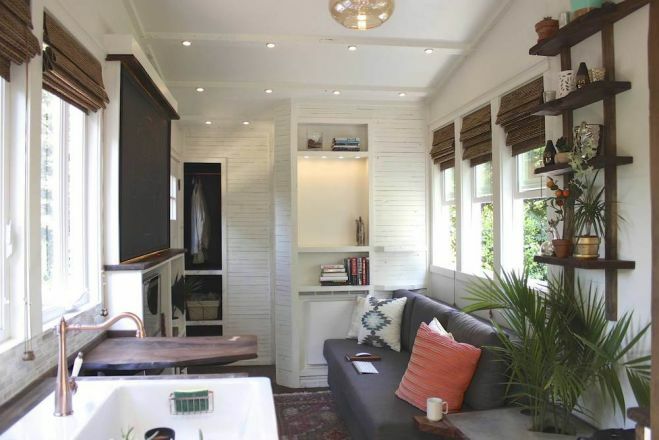 Among the Handcrafted Movement's artful creations is an enchanting tiny house on wheels that is a true work of marvel. It only takes a peek at this stunning tiny creation to see the sheer attention to detail that goes into Impola's handcrafted concoctions, from the finest woodwork conventions to the most formidable decor and design. 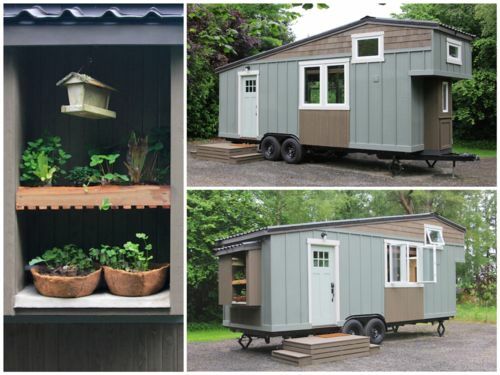 When art meets tiny living, you get a beautiful Handcrafted Movement tiny home. Come and visit this wheeled abode with us, and you will see what we mean. Impola enjoys combining different materials and textures in all of his work, and this is immediately evident in his tiny house's exterior. Every single detail here should be noticed, celebrated and cherished. From the charming little garden on one side of the house to the interesting combination of contrasting wooden textures, everything has been meticulously thought out and pieced together to create a modern design that also appeals to classical conventions. And the inside is just as wonderfully assembled. 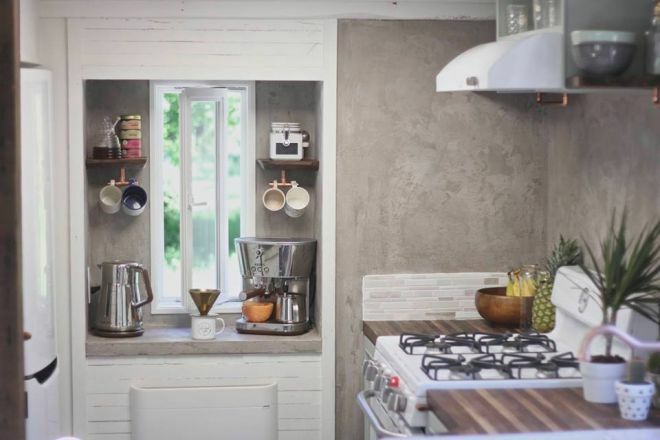 This is a dream abode for tiny house aficionados, with its refined woodwork and collection of handmade fixtures, as well as all of the facilities that make this house a fully functioning home. Here is the cozy living area. Contrasting textures, colors, and decorative pieces create a photogenic setting filled with the best furnishings and ample storage space. 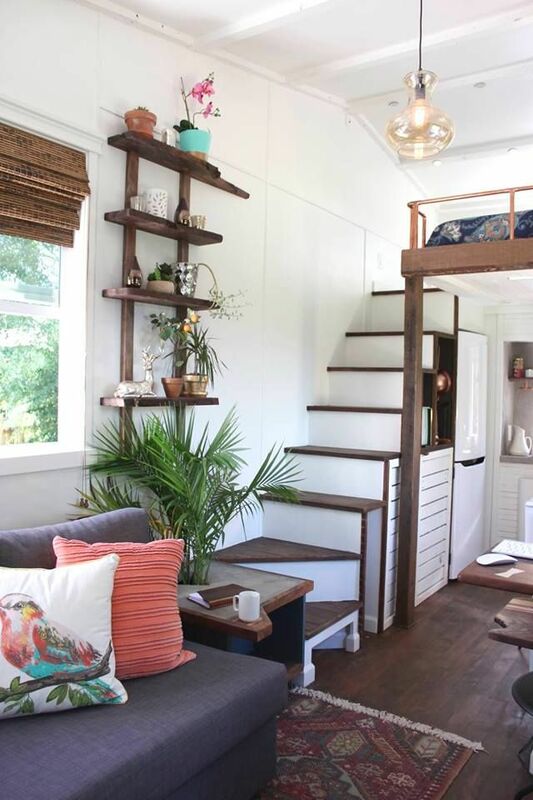 With windows and interior lighting fixtures aplenty, this tiny house just naturally glows with warmth and exuberance. And the nuanced details continue to amaze. Like that coffee table in the corner, the shelves adorned with plants and decorative pieces, or even the cleverly concealed storage space right under the staircase. 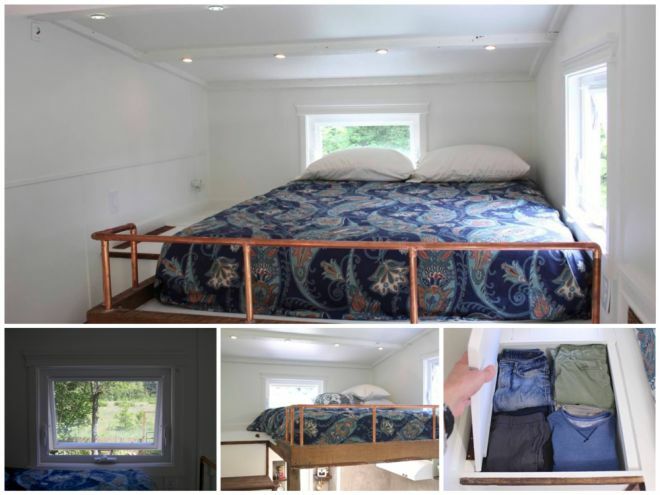 As one would expect with the best tiny houses, the Handcrafted home has a futon that coverts into added bedding. There is something so harmonic about the composition of elements in the Handcrafted Movement tiny house. 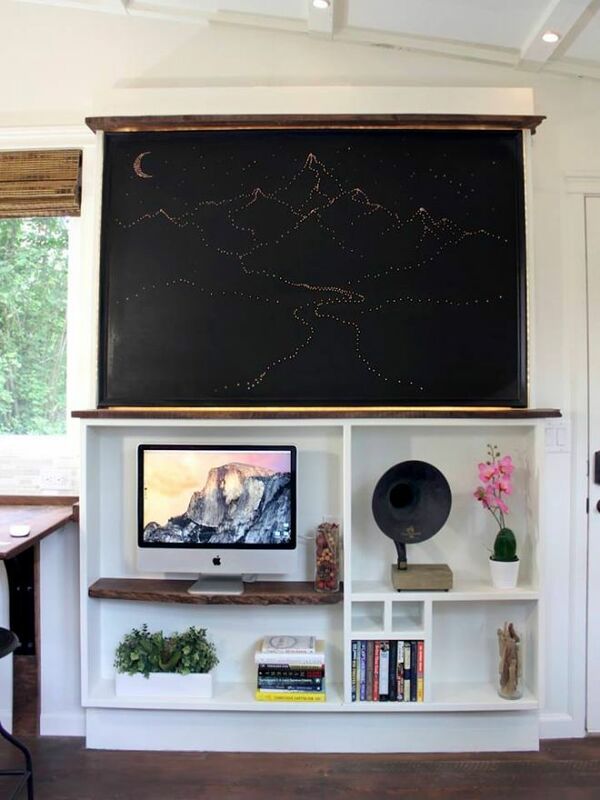 Just look at this shelf and the playful positioning of books, sculptures, wall decor, plant materials and a computer monitor - pieces that you wouldn't normally think of putting in a single place, yet everything works so perfectly. 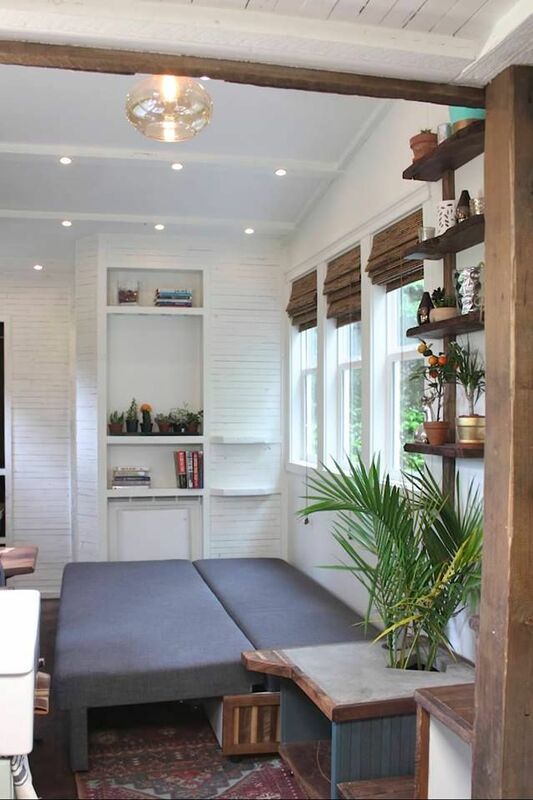 The great thing about this tiny house is that every room is unique in its appearance. As you can see, the kitchen looks very different to the living area. Staying true to the mixed-material motif, the kitchen area combines the best traditional wooden elements with the modern appliances and facilities. 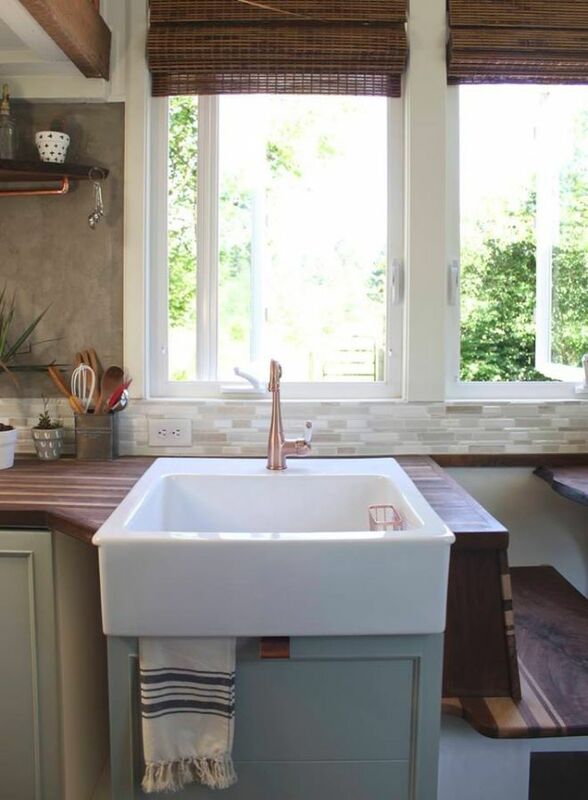 Even the kitchen sink is an ode to experimentation, with its sleek enamel finish contrasting with a copper tap and a wooden support surface. 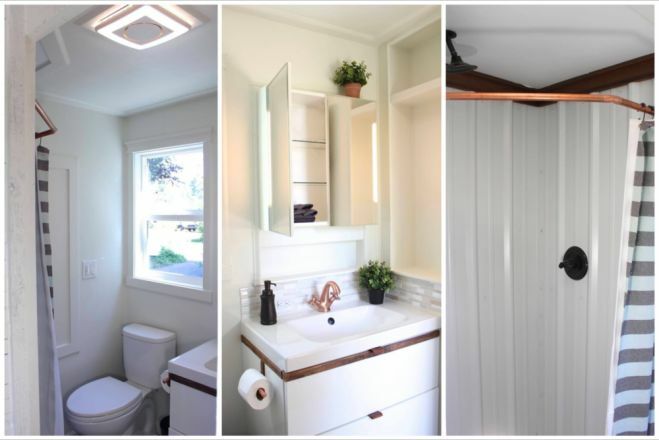 The bathroom is very polished and pristine, but also simplistic in true tiny house fashion. Finally, the upstairs bedroom loft is spacious, storage-savvy, well-illuminated and - like every other room - perfectly planned out. Those copper support rails are a nice addition to the bedding. It is a pleasure to see such a meticulously crafted tiny house. Matt Impola should be proud of his Handcrafted Movement abode, which is a masterpiece of materials, shapes, and composition. 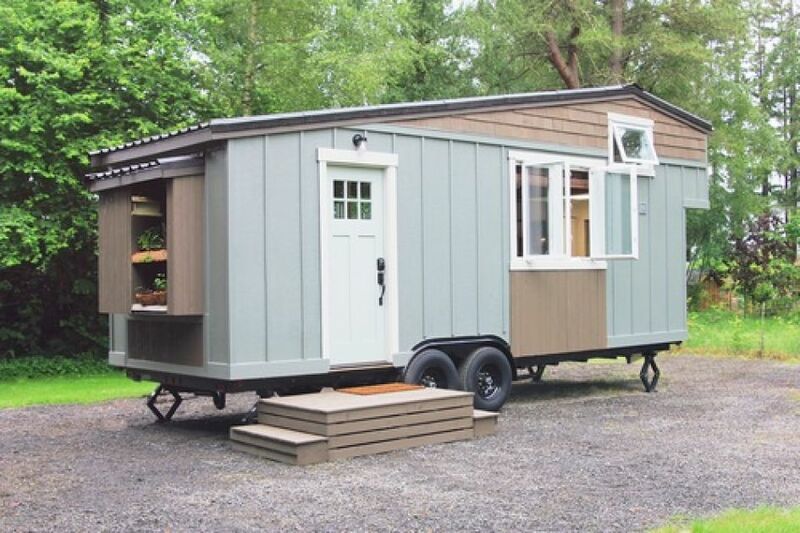 A ravishing and fully livable dwelling, the Handcrafted Movement tiny house is an inspiration for all tiny house enthusiasts who appreciate the finest aesthetics. Venture into the mountainous landscapes of Boulder, Colorado, and you will find a tiny house building company that has made simplicity its lifelong mantra. 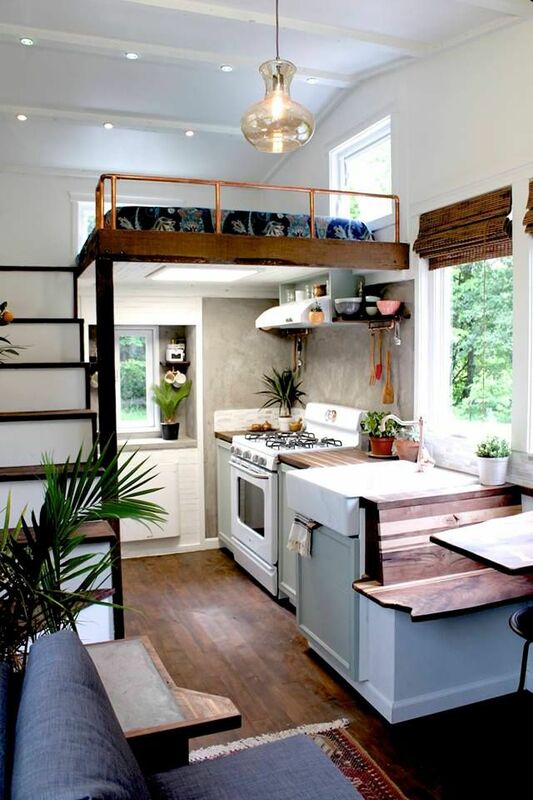 This tiny house sleeps five! A well-proportioned floor plan with a gorgeous rustic exterior. This unique layout includes a foyer crowded with storage units, but it has two lofts that make up the difference.